My kids have suddenly become obsessed with the DVD of Bagpuss, which affords another chance to become immersed in this antiquey Smallfilms production from that interesting moment, 1974–75, when folk started to go all dusty and parochial. It's a series that's deeply saturated in ghostly echoes of the folk revival – full of songs, nursery rhymes and lyrics that are set to ballads and rustic old tunes. Each episode, in fact, turns on a story about an old item or fragmentary relic brought into Emily’s shop, at first unidentified, then gradually unravelled or mended by singing its history and identity into being – almost a metaphor for the whole process of folk revival itself. Professor Yaffle, the ‘wise’ old woodpecker, purports to be the authority on all the antiques, but like many professional folk historians of yore, he often makes wrong assumptions about their provenance based on conjecture and his own self-importance. Bagpuss’s resident singer- storytellers, Madeleine the Rag Doll and Gabriel the Toad, are the ones who breathe life into all the broken fragments, and they were voiced by Sandra Kerr and John Faulkner, real life folkies who had been associated with Ewan MacColl and Peggy Seeger's hard-line Critics Group in the 1960s. The duo have recently acknowledged the enduring affection for this BBC series and 'reformed', playing at this year's Sidmouth Folk Week among other dates. What I notice and marvel at now, re-watching the series with a critical eye, is how subtly subversive it is, and how truly it adheres to the spirit of folk as an alternative people's history and mildly anarchic force, upsetting the normal orders of power and reversing stereotypical tales. Take for instance the episode entitled “The Frog Princess”: at the end the princess kisses her frog, he doesn't change into a prince but instead she is recast as a frog herself, to live happily ever after as a lowly beast, in renunciation of her royal status. In “The Owls of Athens”, the titular birds were great singers but became greedy to be rewarded for their talents, and have their singing voices confiscated by the moon. A cautionary tale, perhaps, for anyone seeking to make excessive cash out of the people's music (Steeleye Span, for instance, were enjoying their commercial, glam-rock-inspired high watermark at exactly the same timeBagpuss was transmitted). The episode also includes “The Bony King of Nowhere”, which paints a bleak portrait of a king driven to mad, aimless distraction by his powerful office. “The Fiddle” draws on the common folk tale of a violin that drives its player and audience into uncontrollable fits of dancing - a story also invoked by Kate Bush on “Violin”, from 1980'sNever for Ever. And of course being an Oliver Postgate production it has an endearingly homemade, craft-y feel – the hand-drawn illustrations for the songs, for instance, are kind of rubbish in some ways, swashed-out watercolours and scribbles. But what a world away from kids' TV today, with its garish colour schemes and its sense – pervasive across all TV broadcasting these days, not just for children – that it has to clamour to keep its audience’s attention span before it wanders off somewhere else. The thought of anything aimed at today’s children with similarly encoded mild subversion is a distant dream. Bagpuss’s sepia-toned bookend sequences are bang in tune with the retroactive mood of those times, the power-cut years in the immediate pre-punk era. 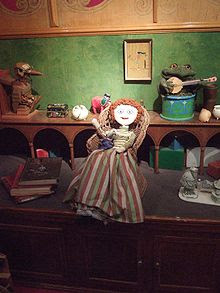 Emily’s chant, to wake the sleeping cat – wise, sleepy demiurge of the old curiosity shop – recalls enchantments of other children’s fables, such as "Oak and Ash and Thorn" from Kipling’s Puck of Pook’s Hill – a song arranged by that folky fan of all things Rudyard, Peter Bellamy. Bagpuss’s hermetic world of lost and unhoused objects speaks directly to that profoundly British obsession with the past and how to reconstruct it.